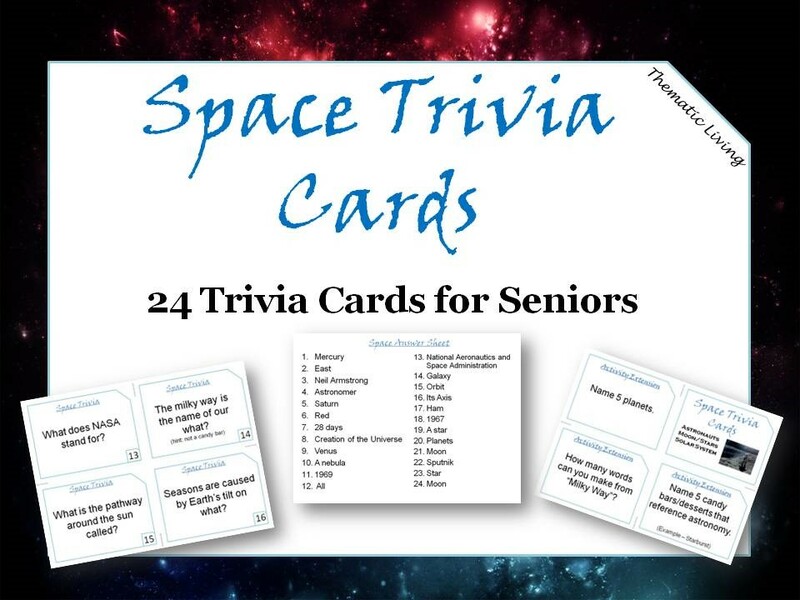 * This resource is also included in the Space Senior Activities - Thematic Activity Plan found here. Trivia is a popular activity and can boost friendly competition among participants. Even though technology has allowed us the access to many things we could not have dreamed of accessing 100 years ago, sometimes the old way is just better. For example, you may use your tablet or computer for trivia, but you may find that the device may not be as efficient as you would like it to be. Trivia cards can be printed and actually held in your hands as opposed to the tapping, typing, or swiping left that is required with modern day technology. Not only is it easier, but may trigger some nostalgia to those participants who enjoyed playing any kind of card game in their yesteryears (goldfish, old maid, poker) or to the sports enthusiast who collected baseball or football cards, unlike using worksheets. Many times, trivia questions are all on one page or the questions and the answers are located on the same page. By using this resource, each card has only one question or task, which makes it easier to add to an existing game (tic tac toe, hangman) because they don't overwhelm the participant and gives a sense of accomplishment when they answer a question correctly. These are perfect to use as a whole or small group, as well as, individually, for one to one sessions, in stations, or as a part of your visitor packet. Also included are activity extension cards, these cards allow for a bit of a challenge and extends the activity at the same time.